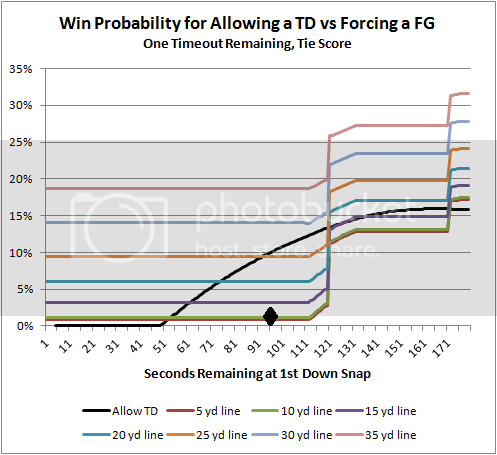 In normal conditions, playing for the stop and a FG yields only about a 1% chance of winning for the defense, which essentially is the chance of going to overtime based on a botched FG. But getting the ball back with 1:30 to play down by 7 equates to about a 9% chance of winning. That assumes a 50% chance in OT and about an 18% chance of a successful TD drive to get there. It was an excellent opportunity for GB to use the intentional TD tactic. PIT was apparently determined to get the TD and either completely unaware of the FG choke hold concept or, as I'll discuss below, too fearful of the FG attempt. On previous plays PIT was throwing into the end zone rather than throwing for just the 1st down or running the ball. If they had been aware, they would have preferred to throw underneath. And on subsequent downs, not only did they appear desperate to get into the end zone, grinding for every inch, they ultimately betrayed their intention by actually scoring. It was mentioned that PIT head coach Mike Tomlin may have been dwelling on GB's blocked FG attempt on their prior possession. It was a block on a very short attempt, also from the 5 yard line. This is an extremely rare event, occurring far less than 1% of the time. But the conditions were snowy, so he may have thought the chance of an unsuccessful FG attempt, due to a block, bad snap, bobbled hold, or anything else was higher than usual. That's a good consideration, but the chance of an unsuccessful attempt would have be several (~9) times higher than typical for it to make the difference. Sure enough, within seconds GB had a first and goal threatening to tie the game. They were unsuccessful, partly due to self-inflicted errors of their own, but the principle stands. PIT should have run out the clock and kicked a FG. And GB should have intentionally allowed the TD. This is what I call the NFL's sub-optimum equilibrium. Neither team does the smart thing, so no one pays the price and (almost) no one notices. I was raging when this happened, it seemed so obvious to me to run the clock down and kick a field goal. The problem is that both methods offer a high chance of winning, so the "best" chance doesn't get strongly considered if it's unconventional. This is a trend I see a lot in sports. It really wouldn't surprise me if Tomlin never even thought about kneeling a couple times and then kicking to win. The NFL truly does exist in a deeply sub-optimal state. I get the analysis. I read the prior, linked articles yet I am bothered. First, an unanswered question from the prior, linked article: Has a team ever won a game by allowing a TD? If it was answered, I missed it. Second, it seems there is parallel between allowing a score and resting starters after securing a playoff seed. Almost like " we won't perform our best now so we might perform better later." The numbers support those decisions, but I wonder if it is possible to build a high functioning team if you don't always demand the best. Again, I get that "you have to be smart." There is a team cultural aspect to this. Tomlin dismissed the question of two kneel-cowns then field goal when asked saying he has no problem with putting his defense on the field to bring home the win. Almost didn't work out. But it could be part of why a team that started 0-4 is still playing like it has a shot at the post season. The question isn't whether a team has won after intentionally allowing a TD with 1:30 to play. The question is whether a team has won after allowing a TD with 1:30 to play regardless of intention. And how likely is that compared to winning when down by 3 with 1 second on the clock? I get the cultural thing, especially as a military guy. But had PIT lost, and they came very close to doing so, what would Tomlin's tough guy players be saying about taking the FG? The response to this on Twitter and elsewhere (those defending Tomlin) is more of a sign of a bad grasp of probability among the general public. Everything has a chance of happening, but not everything has the same chance of happening. That's the problem. Yes, the FG could have been botched. Yeah, and on any given play, a player could break his neck and become paralyzed on the next play too. I would have ordered the kneel down and FG. But the question IS: has anyone ever won after intentionally allowing the TD? Small sample size disclaimer and all that, but if the probably of a win is a function of intent then the whole leadership / momentum discussion plays into the analysis. What irks me most about teams who score the TD on purpose is the lack of logic involved. This isn't some complex issue with 1000 possible outcomes (like going for a 4th and 2 from midfield in the 2nd quarter); this is as cut-and-dry as it gets. The worst part is that every third grader who's ever run into this decision in a game of Madden understands you should allow a TD...yet coaches who've spent 60 years involved with football can't seem to grasp such a simple concept. It's downright embarrassing. I can understand wanting to kick a FG. As a PIT fan I wanted bell to run it and grind the clock down. But if im not mistaken was it bell that fumbled on the 3 yard line? Setting up GB to tie the game. And lets not forget that the chances of an accurate kick in "the frozen tundra" at least seemingly go way up. Weve seen games over the past few weeks where cold weather seemed to nearly cripple special teams. So to say that botching the field goal is similar to a broken neck is a stretch. It wasn't the smartest decision but in the end the defense did what they needed to do, along with critical mistakes committed by the pack. Maybe he figured they would keep messing up as they had done in crucial situations at least 3 times in the second half leading to PIT scoring. Textbook decision? No. But there are way more variables that come into play. The intent is irrelevant. The ONLY question is whether a team is better off down by 7 with 1:30 to play or down 3 with 0:00 to play. We don't narrow down sample sizes based on whether the TD came as a run or pass, or as a deep bomb or QB sneak. Why would we want to narrow the relevant sample based on intent? In short, it don't matter how you got there. I can tell you first hand that plenty of coaches already understand this. Tomlin and McCarthy just aren't in that group (yet). 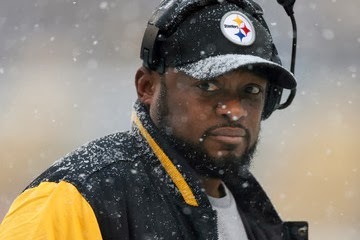 In the weather conditions described, I am not sure why Tomlin's decision is is indefensible. The difference under normal conditions is the difference between 1 % and 9% chance of losing for the Steelers. With the weather conditions, that gap probably closes albeit not entirely. Considering that the stats are not perfectly applicable, I don't think this gap is that significant. I would have preferred the kick route. Regardless, I am curious as to what the expected win percentage would be to kneel on 2nd and try to score a TD with about 45 seconds left. I'm sure anyone who reads this website knows this, but since it hasn't been brought up yet: Patriots coach Bill Belichick allowed the Giants to score at the end of the 2011 Super Bowl, knowing that his best shot at winning the game was giving Brady and the offense the ball back with enough time to score a TD. I'm sure this example is detailed somewhere on the web, and probably somewhere on this site. GB did it in Super Bowl 32 as well. If Tomlin really did the math and felt the conditions were so horrific for kicking the Field Goal as time expired that it was better to score the TD, why did he not go for 2 after the TD? Did the conditions all of a sudden improve? Also wouldn't he have assumed if Greenbay did score a TD they would go for 2 as well since conditions were so bad? Mr McDermott, correct. Although one should also note that the GIants also knew that they should not score the TD, and even had the RB try to stop at the one yard line (but he accidentally teetered in for the TD). Belichick also once challenged a ruling that Buffalo had NOT scored a TD because he wanted the ball back sooner.